Chris Paul has 32 points, 11 assists and seven rebounds to lead Los Angeles. NEW YORK — Chris Paul had 32 points, 11 assists and seven rebounds, Carmelo Anthony added a season-high 28 points and the Houston Rockets snapped a four-game losing streak with a 119-111 victory over the Brooklyn Nets on Friday night. They snapped out of their slump thanks to one of the best games as a Rocket for Paul, who had season bests in points and assists in the final game before his workload should ease Saturday with the expected return of James Harden. The league MVP missed his third straight game with a strained left hamstring and Coach Mike D’Antoni said he would probably return for the second half of a back-to-back in Chicago. Caris LeVert scored 29 points for the Nets. CLIPPERS 120, MAGIC 95: Lou Williams was perfect on five 3-point attempts and scored 28 points to lead visiting Los Angeles. Tobias Harris had 21 points and Danilo Gallinari 13 for Los Angeles, which registered its 10th straight win over the Magic. Boban Marjanovic made his first start for the Clippers and finished with 10 points and 11 rebounds. Nikola Vucevic led Orlando with 22 points and 11 rebounds. THUNDER 134, WIZARDS 111: Continuing its turnaround from a terrible season start, visiting Oklahoma City picked up its fourth consecutive victory by beating struggling, booed-at-home Washington. From 0-4 to 4-4, the Thunder are clicking right now, led by Westbrook, who missed the first two games after a procedure on his right knee and sat out the final quarter of the rout at Washington. And even though OKC was the team playing on the second night of a back-to-back, it looked a lot fresher and more active than Washington, which was coming off a two-day break and finally got to see new center Dwight Howard make his debut. 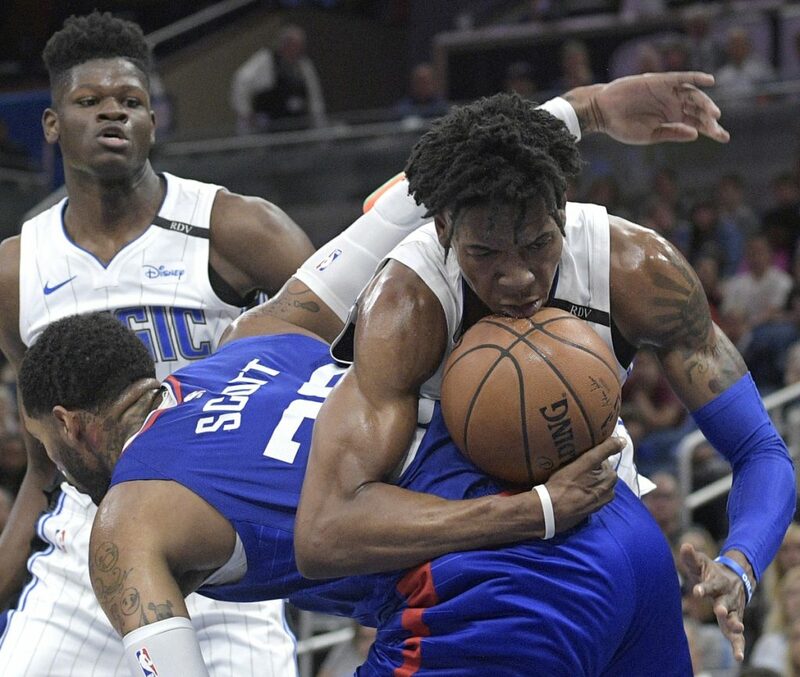 After missing all of training camp, every exhibition game and the first seven regular-season games with a sore backside, Howard started and immediately appeared to have an impact, scoring 13 first-quarter points. But soon enough, Washington got into its usual bad habits, the ones that have led to loss after loss so far: ineffective defense and low-effort rebounding. The Wizards have lost four games in a row to drop to 1-7, and spectators let the players hear their displeasure in the second quarter, jeering when OKC went ahead 61-40 on Jerami Grant’s dunk on a pass from Westbrook. When Paul George made his third straight 3 attempt, a night after going 0 for 10 from beyond the arc, it made the halftime score 79-50, equaling the Thunder’s record for most points in a half. PACERS 107, BULLS 105: Victor Oladipo had 25 points and 14 rebounds, and Darren Collison made a tie-breaking jumper with 17.8 seconds left to help Indiana win at Chicago. Myles Turner added 18 points and Collison finished with 14 as Indiana earned its fifth consecutive road win for its longest such streak since April 2012. Turner also blocked six shots, including Antonio Blakeney’s desperate jumper as the final seconds ticked off. CAVALIERS: Forward Kevin Love will be out at least six weeks – and maybe longer – after surgery on his left foot, another blow to a team in disarray in its first season following LeBron James’ departure. Love, who injured his left big toe in Cleveland’s first exhibition game, had the operation Friday in New York at the Hospital for Special Surgery. The team said his timeline to return to basketball activity will be updated in about six weeks, which means he could be out even longer. Love, 30, played in Cleveland’s first four games before the pain became intolerable. He underwent tests this week and said doctors were still trying to determine the best course of action. Love said the injury became so severe he was having trouble walking and it was affecting his game as he made only 32 percent of his shots. In his lawsuit, Boylan’s attorney provided the transcript of a voicemail left by Lue telling him the team was moving in a different direction. Boylan also contends GM Koby Altman told him owner Dan Gilbert wanted a younger coach.